Stargardt disease is the most common form of inherited juvenile macular degeneration. Decreased central vision with decreased color perception is a hallmark of Stargardt disease, whereas side vision is usually preserved. The condition can be caused by mutation in one of 4 different genes, but significant overlap exists with some other genetically determined conditions. Stargardt disease (also known as Stargardt macular dystrophy or fundus flavimaculatus) is the most common form of inherited juvenile macular degeneration. Decreased central vision with decreased color perception is a hallmark of Stargardt disease, whereas side vision is usually preserved (this also differentiates Stargardt disease from retinitis pigmentosa, where peripheral vision is firstly affected, only eventually developing in central vision loss). The progressive vision loss associated with Stargardt disease is caused by the death of photoreceptor cells in the central portion of the retina called the macula. The macula is responsible for sharp central vision — for tasks like reading, watching television, and looking at faces. Onset of Stargardt disease is typically in childhood or adolescence and the progression rate is quite variable. Eventually, almost everyone with Stargardt disease has a visual acuity in the range of 20/200 to 20/400. The vision loss is not correctable with prescription eyeglasses, contact lenses, or refractive surgery. Patients may exhibit color vision deficiencies. 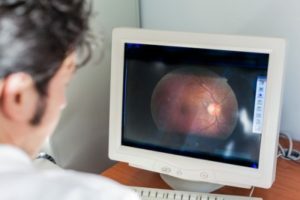 The degree and type of colour vision deficiency correlate better with best-corrected visual acuity (BCVA) than with full-field electroretinography (ffERG) results. Yellowish flecks in and under the macula are typically observed at first ophthalmologic examination. Flecks are deposits of lipofuscin, a fatty byproduct of normal cell activity, which accumulates abnormally in Stargardt disease. A “beaten-metal” appearance in the fovea or parafoveal region is typical. The “dark choroid” sign on fundus fluorescein angiography in seen most cases. Clinical trials currently ongoing all over the world on Stargardt disease patients are listed at clinicaltrials.gov. The incidence of Stragardt disease is estimated in in 1 on 8000–10,000 individuals. However, the healthy carrier frequency in the general population is estimated to be higher than expected from the incidence (ABCA4 mutation carriers are about 1:20). Stargardt disease is most commonly inherited as an autosomal recessive trait. However, Stragardt disease-3 (ELOVL4 gene mutations) is inherited in an autosomal dominant fashion. In Stargardt disease-1 (ABCA4 gene mutations) pseudodominant transmission may also be expected because of the relatively high carrier frequency of pathogenic ABCA4 variants (up to three or four ABCA4 pathogenic alleles may be found in the same family). Stargardt disease-1 (STGD1) is caused by homozygous or compound heterozygous mutation in the ABCA4 gene on chromosome 1p22. Over 800 mutations in ABCA4 are now known to cause Stargardt disease. Both point mutations and large deletions have been reported. The estimated carrier frequency of ABCA4 mutations in the general population is 1:20. Due to extensive genetic heterogeneity, observed variant-associated phenotypes can manifest tremendous variability of expression. Deep intronic mutations in the ABCA4 gene have also been reported, hence the importance of a thorough screening of the entire genomic locus of this gene. ABCA4 was first characterized in 1997 as the causal gene for Stargardt disease. Shortly thereafter several other phenotypes were associated with mutations in ABCA4, which now have collectively emerged as the most frequent cause of retinal degeneration phenotypes of Mendelian inheritance. Other ABCA4-associated phenotypes include: cone-rod dystrophy 3, retinitis pigmentosa 19 and age-related macular degeneration 2. The mutation spectrum of ABCA4 has been found to differ consistently among different ethnic groups. Complex alleles have also been reported (e.g. the p.[(L541P; A1038V)] in Central Europe). Overall, ABCA4 mutations are estimated to account for 80% of all Stargardt disease cases (and for about 30% of all cone-rod dystrophy cases). A clinical subtype of Stargardt disease-1, called juvenile macular degeneration, is caused by mutation in the CNGB3 gene. The term Stargardt disease 2 (STGD2) has been withdrawn because the genetic loci originally identified was found in error and later on remapped on the STGD3 locus. Stargardt disease-3 (STGD3) is caused by mutation in the ELOVL4 gene and shows autosomal dominant inheritance. Stargardt disease-4 (STGD4) is caused by mutation in the PROM1 gene and it also shows autosomal dominant inheritance. In a two generation family ABCA4 disease-causing mutations have been found in addition to GPR143 pathogenic mutations (ocular albinism type 1). Patients variably expressed a complex, overlapping phenotype associated with both Stargardt disease and X-linked ocular albinism (OA1). A clinical prenatal diagnosis based on US examination is not possible. Molecular testing is possible only if the familial disease-causing mutation is known. Identification of ABCA4 retinopathies provides a specific molecular diagnosis and justifies a prompt introduction of simple precautions that may slow disease progression. Best vitelliform macular dystrophy (BEST1 gene mutations) is a slowly progressive macular dystrophy with onset generally in childhood or teenage years. Decreased central visual acuity and metamorphopsia are typical, whereas patients retain normal peripheral vision and dark adaptation. In one patient with BEST1 mutations, a bull’s-eye maculopathy (which can be usually seen in cone-rod dystrophy, Stargardt disease and other maculopathies) was found. Late-onset retinal degeneration (LORD, C1QTNF5 gene mutations) is an autosomal dominant disorder characterized by night blindness and punctate yellow-white deposits in the retinal fundus. However, the peripheral vision is also compromised in LORD and the onset is typically in the fifth to sixth decade. Hypotrichosis with juvenile macular dystrophy (HJMD) is caused by homozygous mutation in the CDH3 gene. Patients do not show any other manifestations of ectodermal dysplasia. Cone-mediated as well as rod-mediated vision loss with slight peripheral retinal dystrophy can be seen. Some patients with vitelliform macular dystrophy 3 (PRPH2 gene mutations) may be originally given a diagnosis of Stargardt disease. Vitelliform macular dystrophy 3 is characterized by a solitary, oval, slightly elevated yellowish subretinal lesion of the fovea. However, onset is usually later than in Stargardt disease, as it mainly occur in the fourth or fifth decade of life with a protracted decrease of visual acuity and mild metamorphopsia. Occult macular dystrophy can be easily differentiated from Stargardt disease by fundus examination, since the macula appear to be completely normal. However, age of onset, clinical symptoms and progression may vaguely recall Stargardt disease, especially because of reduced visual acuity and possible mild disturbances of color vision. Patients have severely reduced focal macular ERGs (whereas full-field ERGs are normal). Occult macular dystrophy patients are believed to have localized retinal dysfunction distal to the ganglion cells in the central retina. The disease shows autosomal dominant transmission and is caused by mutation in the RPIL1 gene. X-linked atrophic macular degeneration (RPGR gene mutations) is characterized by primarily macular atrophy causing progressive loss of visual acuity with minimal peripheral visual impairment. It usually presents in males. Full-field electroretinograms (ERGs) may show normal cone and rod responses is some affected males. Sorsby fundus dystrophy is an autosomal dominant retinal dystrophy characterized by the loss of central vision as a result of macular disease by the fourth to fifth decade and peripheral visual loss in late life. Sorsby fundus dystrophy is autosomal dominant and it is caused by heterozygous mutation in the TIMP3 gene. In some patients with con-rod dystrophy 7 (RIMS1 gene mutations, autosomal dominant inheritance), features highly suggestive of a Stargardt-like disease can be found. Cone-rod dystrophy (CORD) characteristically leads to early impairment of vision. An initial loss of color vision and of visual acuity is followed by nyctalopia (night blindness) and loss of peripheral visual fields. Due to high genetic heterogeneity and because of some clinical overlap with other genetically determined ophthalmopathies, it is highly recommended that panel testing is performed. Panels based on clinical exome sequencing (6,000 genes; EXOME PANEL) open the possibility to explore mutations in any additional gene if the first panel is negative. Large deletions/duplications may be initially inferred by appropriate calculations on sequencing data and later on confirmed by dedicated methods such as MLPA or qPCR. Posted in Academia, Disease cards, Last Update, Medical Genetics and tagged ABCA4, BEST1, C1QTNF5, CDH3, CNGB3, ELOVL4, PROM1, PRPH2, pseudodominant inheritance, RIMS1, RP1L1, RPGR, Stargardt disease, TIMP3.